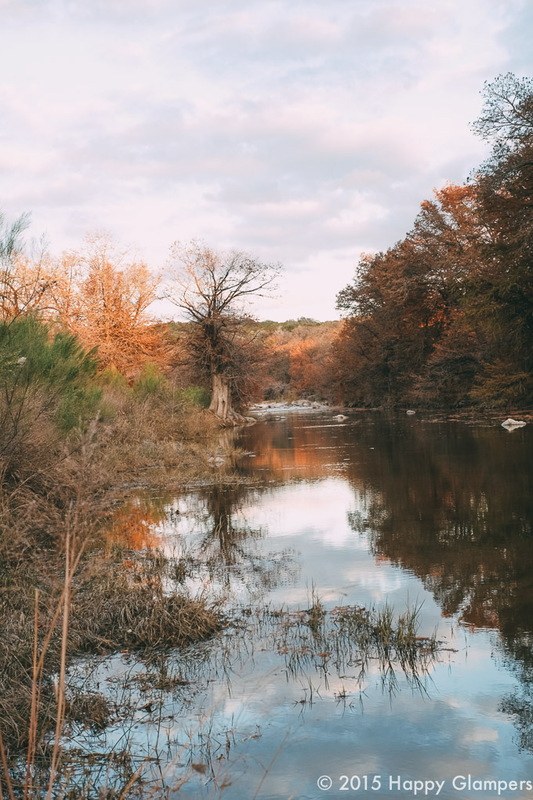 Now most of what makes a holiday special is the people you share it with, and the tearing up started early in the season when my BFF, Nicole, and I hatched this plan together: pack the Airstreams, grab the kids, meet you in the Texas Hill Country. 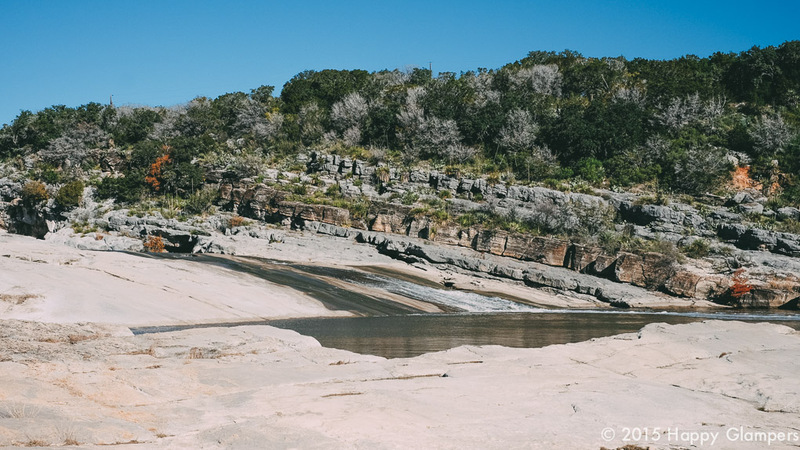 We returned to Pedernales State Park which was like a whole different park in cool weather. The trees were still largely hanging onto their leaves and the nights were finally cool enough to spend around a campfire telling stories. A really glampy Glampsgiving takes some planning. First of all, apparently this is a popular camping weekend and the entire campground was full, so do make reservations at least a month ahead. Then, plan out your menu. Nicole, and I began scheming the menu a while out. 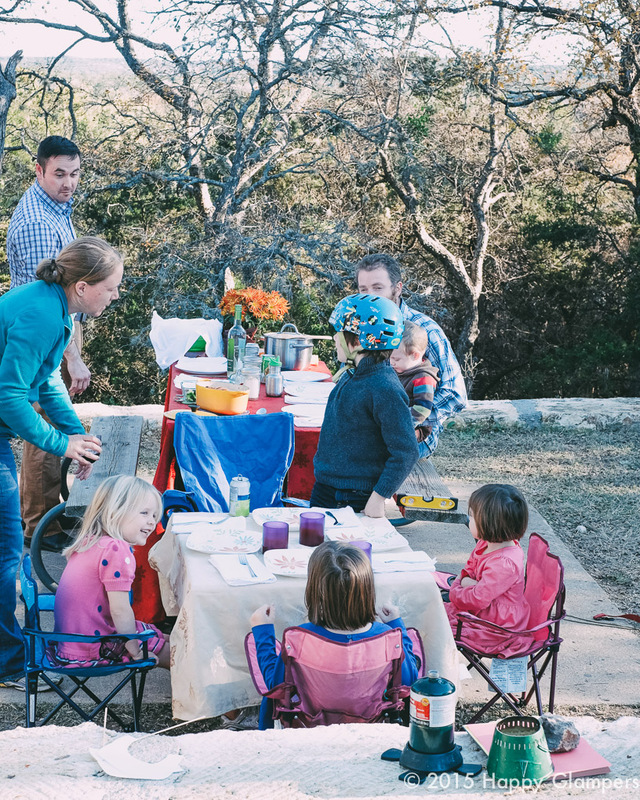 We thought it would be fun to do the whole traditional Thanksgiving meal, but then there were logistics. Honeysuckle Manor doesn’t have a real oven, and the microwave/convection combo is a bit tricky. I’ve figured out a trick to actually get the correct temperature (set the temperature for 50 degrees higher than what the recipe calls for, yeah, 50 more) but oven itself is kinda small; no way a turkey could fit in there! Nicole has a 27ft Flying Cloud that I am totally in love with, which has an actual oven, but first we toyed with skipping the whole roasting thing and considered deep frying, I mean, yum. I’m sure by now that some of you think that we are all ridiculous. And we are. But one of the grownups finally put the brakes on the fry-a-turkey plan… having young children running around the fryer was just kind of a bad idea. Then Nicole suggested smoking the turkey and bringing a smoker with them. Very interesting! That was the plan, until we thought about the leftovers. I mean, you know the refrigerators in the Airstreams are not all that big and our kids are kids and would probably take one bite each and declare themselves full until dessert and then we’d all be turkey the entire trip (and we all know one of the glampiest parts of glamping is variety in your meals). Back to the drawing board. And then Martha Stewart Living December 2014/January 2015 happened. Admission: I am more obsessed with this magazine than is healthy. In no way is my home a reflection of this obsession put to good practice, but a girl’s gotta have goals, right? I mean, someday I’ll also start a fabulous collection of heirloom ladels and they will grace a perfectly set table in an immaculate home, right? Yeah, maybe I’ll just stick to Martha-ing the stuffing out of the Airstream…. But I digress. In this issue is the ultimate Glampsgiving turkey: meat and stuffing in one cute roll and wrapped up in bacon. Oh the joy! I’m tearing up just thinking about it. It was the perfect Thanksgiving. We spent the morning scrabbling over rocks and playing. After lunch the grown ups spilt up the cooking between the two kitchens. We set the picnic table, covered in a lovely cloth of course, opened a bottle of wine, and said our thanks. Pretty sure I was all misty the entire time looking around the table at such dear faces, laughing all the while, outside in a beautiful park. Glampsgiving, oh, yeah. The meal was delicious, and there were no leftovers, just 4 stuffed grown ups patting our bellies as the kids ran off the pie. I am still so thankful for this day. Oh, and here I go with the tears again…..
Any other Glampsgiving traditionalists out there? We’d love to hear your favorite holiday recipes! Happy Thanksgiving, glampers! We are thankful for all of you and this awesome community! Preheat oven to 375. Bake bread crumbs on baking sheet for 10 min or until they are dry and edges are golden, transfer to bowl. Place turkey on cutting board and slice through the thickest part to create a flap. Cover with plastic and use a mallet to thin the meat evenly (to about 3/4 inch thickness). Remove plastic and season with salt and pepper. Heat butter in a skillet until foamy, add onion, garlic, celery, herbs and 1/2 tsp salt. Cook until onion is translucent, about 4 min. Transfer to bowl with bread and add broth, cranberries, and pistachios. Stir and season with salt and pepper. Place turkey skinned side down on a cutting board and again season with salt and pepper. Spread stuffing mixture on the top, leaving a 1/2 inch border on edges. Beginning with the shortest side, roll the turkey up tightly. Place seam side down and drape the bacon over the turkey to cover completely. Use kitchen twine to tie it all up nicely, use four ties spaced evenly. 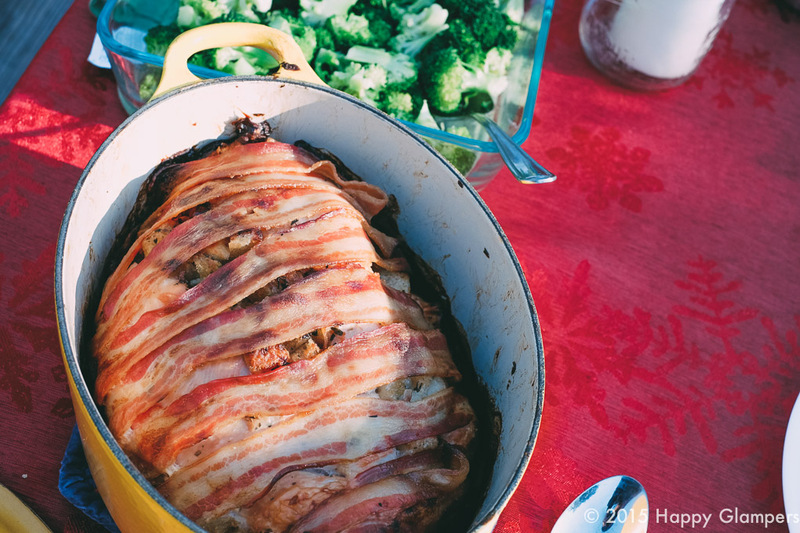 Carefully transfer your masterpiece into a medium roasting dish or dutch oven. Roast until a thermometer stuck in the thickest part reads 155, about 1 hour and 10 minutes. Let rest 15 minutes before carving. So true! Wish we could do it again this week…. Next year?